Here are the two chapter sized banners I've been working on as a commission for a friend of mine. 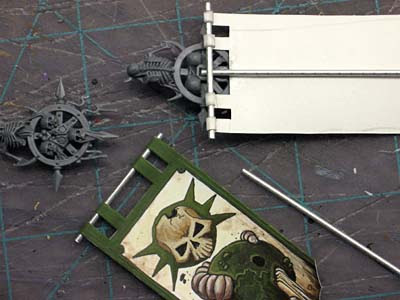 He just got me the bitz to make the top of the banner poles. Now that I have all the pieces, I just need to find a day where I can assemble both banners and finally get them finished. Since this post is fairly old, I figured I'd go back and add a few more links to bring it up to date so folks can get a better idea of the process involved in making your own banners. Your banners look awesome as usual! Are prints your banners? Or did you hand-paint them? Thanks guys, they are hand drawn and hand painted. The actual imagery comes from what the "client" wants on there. Wow, that free-hand is epically good! Very nice Ron! Thanks Kevin, I enjoy taking the time and painting them up and really seeing how much detail I can get into them.